HAMPTON CO., SC (WTOC) - Hampton County, SC has dealt with some major animal cruelty cases in the past few months, but no one has been arrested. Why haven't these people, who have abused animals and even let some die, been arrested? There is a much larger process when it comes to charging someone with animal abuse in Hampton County. 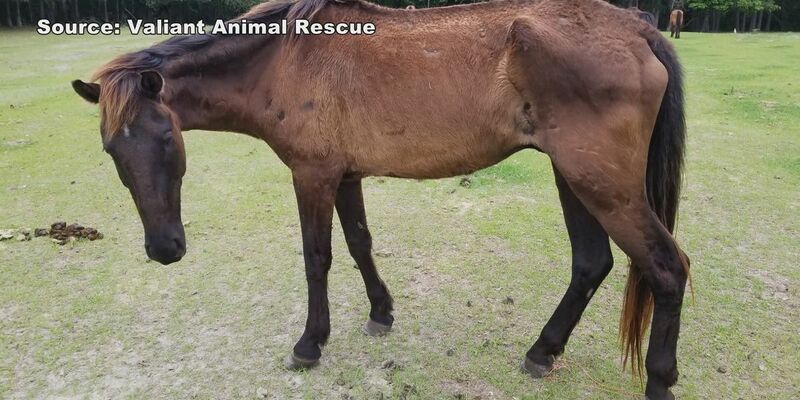 One case involved 23 emaciated horses that had to be rescued from an Early Branch property. Some of the horses died and others are being nursed back to health. The other case involved over 100 dead animals found on another property in the area. These cases are different but are similar in a couple of ways: they both involve animal cruelty, and no one has been arrested. Code Enforcement Officer Tim Latham says animal control gets the complaint. They go investigate it and handle it through the Magistrate's Court. If it is a bigger case, it goes to General Session's Court. "If I want to issue the person a citation, it is a county citation that's tried in Magistrate Court only. I will issue them the citation, give them a court date and they have to appear on that court date," Latham said. Hampton County Sheriff T.C. Smalls said they only assist the Code Enforcement Office with these cases when they are asked. South Carolina's animal abuse law partially states that a person who abuses an animal is guilty of a felony and can be punished by imprisonment and a fine. "It can be up to five years and a $5,000 fine and I don't take anything to general sessions because of the process of taking someone to general sessions." The people reportedly responsible for abusing the horses, James and Stormi Grizzard, have still not been arrested. The woman found with over 100 dead animals on her property has been charged, but not arrested. These cases are still under investigation.